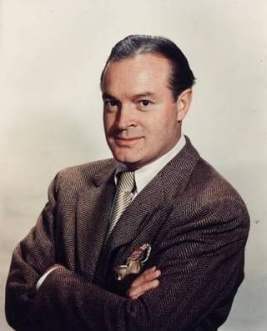 Bob Hope was an entertainer and comic actor, known for his rapid-fire delivery of jokes and his success in virtually all entertainment media. 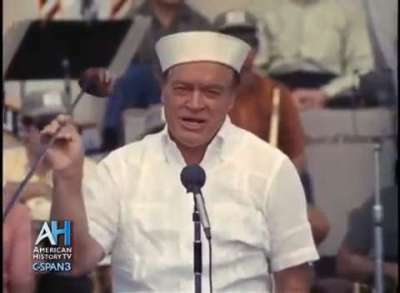 Born in 1903, Bob Hope was a British-born American entertainer and comic actor known for his rapid-fire delivery of jokes and one-liners, as well as his success in virtually all entertainment media and his decades of overseas tours to entertain American troops. Hope received numerous awards and honors for his work as an entertainer and humanitarian. He died on July 27, 2003. 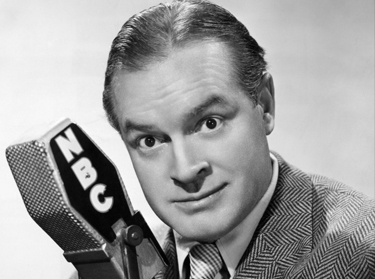 Born as Leslie Townes Hope in 1903, Bob Hope reigned as the king of American comedy for decades. He started out his life, however, across the Atlantic. Hope spent his first years of life in England, where his father worked as a stonemason. In 1907, Hope came to the United States and his family settled in Cleveland, Ohio. His large family, which included his six brothers, struggled financially in Hope's younger years, so Hope worked some jobs, ranging from a soda jerk to a shoe salesman, as a young man to help ease his parents' financial strain. By the early 1930s, Hope had gone solo. He attracted widespread notice for his role in the Broadway musical Roberta, which showcased his quick wit and superb comic timing. Around this time, Hope met singer Dolores Reade. The pair married in 1934. He again showed off his comedic talents in the Ziegfeld Follies of 1936. Later that year, Hope landed a leading part in Red, Hot, and Blue, with Ethel Merman and Jimmy Durante. In 1937, Hope landed his first radio contract. He got his show the following year, which became a regular feature on Tuesday nights. Week after week, listeners tuned in to hear Hope's snappy one-liners and wisecracks. He became one of the radio's most popular performers and stayed on the air until the mid-1950s. In 1940, Hope made his first film with popular crooner Bing Crosby. The pair starred together as a pair of likable con artists in The Road to Singapore with Dorothy Lamour playing their love interest. The duo proved to be box office gold. Hope and Crosby, who remained lifelong friends, made seven Road pictures together. While his film career began to ebb in the 1950s, Hope enjoyed a new wave of success on the small screen. He starred in his first television special on NBC in 1950. His periodic specials became a long-standing feature on the network, managing to earn impressive ratings with each new show over a 40-year time span. Nominated several times over the years, Hope won an Emmy Award in 1966 for one of his Christmas specials. During World War II, Hope began to take regular time out of his film and television career to entertain American soldiers. He started out with a radio show he did at a California air base in 1941. Two years later, Hope traveled with USO performers to bring the laughs to military personnel overseas, including stops in Europe. He also went to the Pacific front the following year. In 1944, Hope wrote about his war experiences in I Never Left Home. While he and his wife Dolores had four children of their own, they spent many of their Christmases with the troops. 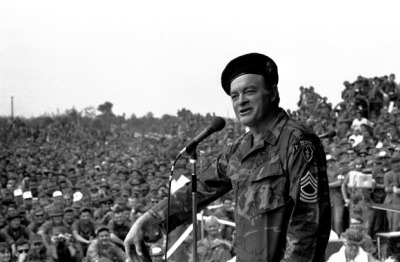 Vietnam was one of his most frequent holiday stops, visiting the country nine times during the Vietnam War. 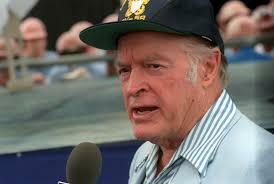 Hope took a break from his USO efforts until the early 1980s. He resumed his comedic mission with a trip to Lebanon in 1983. In the early 1990s, Hope went to Saudi Arabia to cheer on the soldiers who were engaged in the First Gulf War. Hope traveled the world on behalf of the country's servicemen and women and received numerous accolades for his humanitarian efforts. His name was even placed on ships and planes. Perhaps the greatest honor, however, came in 1997: U.S. Congress passed a measure to make Hope an honorary veteran of the U.S. military service for his goodwill work on behalf of American soldiers. By the late 1990s, Hope had become one of the most honored performers in entertainment history. He received more than 50 honorary degrees in his lifetime, as well as a Lifetime Achievement Award from the Kennedy Center in 1985, a Medal of the Arts from President Bill Clinton in 1995 and a British knighthood in 1998. The British-born Hope was especially surprised by the honorary knighthood, saying, "I'm speechless. Seventy years of ad-lib material and I'm speechless." In 2000, Hope attended the opening of the Bob Hope Gallery of American Entertainment at the Library of Congress in Washington, D.C. In the following years, he became increasingly frail. 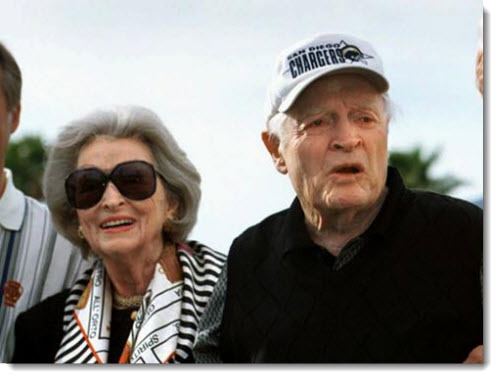 Hope quietly celebrated his 100th birthday in May of 2003, at his Toluca Lake home. There, he died of pneumonia on July 27, 2003.